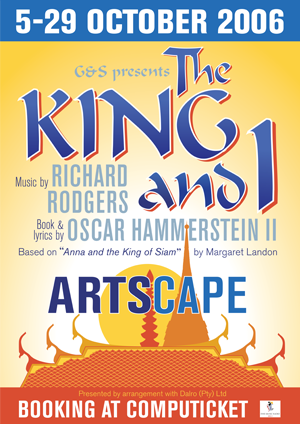 The King and I is a musical, the fifth by the team of composer Richard Rodgers and dramatist Oscar Hammerstein II. It is based on the 1944 novel Anna and the King of Siam by Margaret Landon, which derives from the memoirs of Anna Leonowens, governess to the children of King Mongkut of Siam in the early 1860s. The musical’s plot relates the experiences of Anna, a British schoolteacher hired as part of the King’s drive to modernize his country. The relationship between the King and Anna is marked by conflict through much of the piece, as well as by a love that neither can admit. The musical premiered on March 29, 1951, at Broadway’s St. James Theatre. It ran nearly three years, then the fourth longest-running Broadway musical in history, and has had many tours and revivals. In 1950, theatrical attorney Fanny Holtzmann was looking for a part for her client, veteran leading lady Gertrude Lawrence. Holtzmann realized that Landon’s book would be an ideal vehicle and contacted Rodgers and Hammerstein, who were initially reluctant but agreed to write the musical. The pair initially sought Rex Harrison to play the supporting part of the King, a role that he had played in the 1946 movie made from Landon’s book, but he was unavailable. They settled on actor and television director Yul Brynner. The musical was an immediate hit, winning Tony Awards for Best Musical, Best Actress (for Lawrence) and Best Featured Actor (for Brynner). Lawrence died unexpectedly of cancer a year and a half after the opening, and the role of Anna was played by several actresses during the remainder of the Broadway run of 1,246 performances. A hit London run and U.S. national tour followed, together with a 1956 film for which Brynner won an Academy Award. In later revivals, Brynner came to dominate his role and the musical, starring in a four-year national tour culminating in a 1985 Broadway run shortly before his death. Both professional and amateur revivals of The King and I continue to be staged regularly throughout the English-speaking world.